Its coin processing facility is hard to beat. 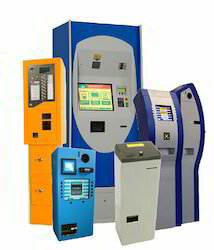 It offers a motorised coin feeding system and houses a validator for up to 16 different coin types,escrow, 4 easy to swap coin magazines as well as a cash box. The machine supports eventual change of currency with a mere change of SW.If required the device can accept bank cards, contactless cards or banknotes.It is manufactured in 2 mm thick stainless steel which along with other mechanisms deter vandalism and fraudulent use. Back up batteries will also support the product in case of an interruption to the power supply.The modular construction of this product allows for easy and efficient swapping in and out of major components without the need to take it out of use.The TVM is designed to stock large paper roll which depending upon the specification varies from 5,000 to 7,000 tickets. 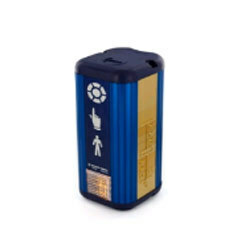 High speed thermal printing mechanism allows for maximum passenger turnover.The device can be equipped with a GSM / GPRS module for data transfer.Other accessories and additional devices can be offered to meet the customer’s individual requirements. Twice the LED’s of its predecessor and still a compact little light with a big attitude! 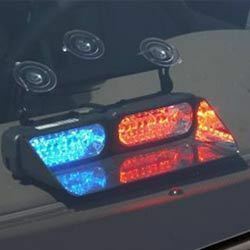 Avenger™ packs full-size Super-LED® power that rivals strobe in intensity. 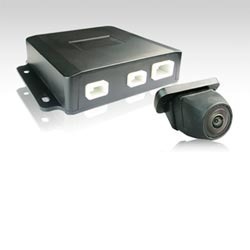 This is serious warning protection in a small package that’s easy to mount or transfer from vehicle to vehicle. 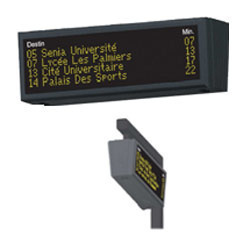 Public and Passenger Information Displays are variable information signs for Bus Stops, Railway Platforms and Metro Platforms. Based in a multiline high density SMD LED matrix, the information can be presented in various configurations. When a customer enters the parking, it provides information (updated in real time) about the number of available spaces through different panels in each module at the parking entrance on each floor and also through the different zones. Power Electronics is an ISO/TS 16949:2009 quality certified organization focused in the manufacturing, sales and service of products & solutions for Public Transportation. Power Electronics has been successfully concentrating on delivering excellent value-for-money solutions to the transportation industry since 1991. With over 22 years of experience in developing, manufacturing, and supporting Roof Lights for buses, Power Electronics has earned a reputation for innovation and engineering quality. 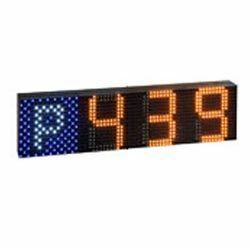 As a matter of fact, Power Electronics was the pioneer for introducing LED Destination Display Signs for Buses in India through a tie up with Europe’s leading manufacturer, M/s Hanover Displays Limited, UK. We have our Hanover Displays product range installed in over 9500 buses over the last 9 years. We are on the approved vendor list of all major OEMs, Government bodies and Transportation Consultants. Most of the large bus OEMs in India (Ashok Leyland, Tata Motors, Volvo, Mercedes, MAN, Mahindra) are our clients. Our 90+ strong team works at the forefront of technologies and processes to help become an efficient & integrated organization and with keeping the best interests of our buyers in mind, we offer extra ordinary support & services to our customers through our well established service network. In addition to products, service and support, Power Electronics can provide assistance at any stage during the development of a project. Continuing the path of success in Transportation, we aim to be the first choice in Road Safety, Intelligent Traffic Management & Parking Management pan India.